I did email the company to tell them the video was very offensive to men, women, and Armenians (they chose a Young Turks media clip because they clearly don't know the history there). And I politely let them know I would cease using their products and take a long look at other P&G products. But why would they shoot themselves ibn the foot? Why would a razor company put out an ad about male behavior and alienate their largest customer base? Basically the trailer came out and the nerdy guys who like WWII games were shaking their heads wondering why a lead character was a woman with a prosthetic arm. Gamers have no problem with female characters and women did serve in WWII (notably in Russia) but it felt out of place and preachy. The game also suffered from gameplay issues and its release tanked Electronic Arts stock 45% and forced them to lower earnings estimates for FY2019. But you have to wonder, do they no know what their consumer wants in a WWII shooter game? They're not alone. Facebook fell nearly 50% in FY 2018. And rightly or wrongly half this country believes Facebook got Trump elected and the other half believes they are actively drumming out conservatives. And both those sides might have a little bit of a case! I'd call that PR nightmare and their share price drop clearly shows they are not handling it well. I can't believe that no one at Facebook was smart enough to say "we're just a non-policing platform and all are welcome to use our site provided they don't commit a crime." Boom. Nobody leaves in disgust. I see it in Chick-fil-A too. I don't understand the link between abortion and sandwiches. Have whatever opinions in your private life but run your business to make money. Acting any other way is unethical by business standards and is actually a financial crime. And I see this in privately held business too. Why doesn't the Christian baker put a big sign out front that he doesn't make gay wedding cakes? Why does he inform a gay couple quietly in the back? He knows if he puts out the sign people like me will think him a bigot who doesn't tend well to his business and walk to the next bakery. I know I can't get a ham sandwich at a Jewish deli but I knew that when I walked in. I'm appalled by these examples of people running their business for some other reason than to be the best in their industry. But the trend is coming real for me. Companies who alienate potential consumers or their core demographic end up losing money. I've just finished divesting myself from P&G over the Gillette ad. I don't know what they're working on right now but clearly supplying me with the best razor at the best price isn't it. And I don't invest in companies who have lost their consumer focus. Ideology (in any direction) is not a market force and it's become one of my lead indicators that a business is failing. I hate to admit that but the trend is appearing. You can't invest in a concern that doesn't put their product or service first. It's been the oddest financial news of 2018.
offensive to men ? That's a new one. I didn't know there was such a thing ? Well in the US about 80% of all discretionary spending is controlled by women. Marketers know this and it's why for decades the vast majority of products had an advertising slant to women and why all the sitcoms make guys appear dumb. You can't poke fun at women and then market to them. And it's not that hard to figure out the demographics where men control the spending. While the vast majority of products are marketed to women it's real easy to get products that "men buy". It's not some freak accident that they advertise beer and pickup trucks during football games. If you watch CNBC or Bloomberg you get adverts about golf clubs, European sports cars, and fancy watches. Now we laugh this off a little and might even take some offense to 80s commercials where selling beer seemed to require barely clothed women but big businesses spend a lot of money getting this right. As a former product developer it's a big chunk of the day. You want the right product at the right price marketed to the right segment of the population. Just think of the money spent by companies to know which segments of the population are getting married or expecting a child. Products are targeted by every demographic you can imagine. That's what blows my mind about these companies. I know Electronic Arts is selling Battlefield V to almost exclusively young men and the desired product is an immersive WWII experience. They know that a female character with a robot arm doesn't belong. It breaks the experience. Maybe the core consumer would actually enjoy unlocking a secret to meet one of the legendary Soviet female snipers. But they should have known their choices were a little off and not delivering the desiredd product. And with Gillette... Could you imagine if Michael Kors had a commercial with a tagline of "Women need to stop dressing like whores". Never. Think of the cliche of being asked to leave a restaurant because you're not dressed well enough. Doesn't happen anymore. You just don't talk down to your customers. When you develop a product or make advertising it's not a guessing game. You do tests and focus groups to make sure you have it right and are attracting the right customer. With the exception of Facebook which seems to relish in making poor decisions that alienate users these are companies who should know they are not delivering on consumer expectation. It smacks of the old Jon Stewart joke about moving to Israel to open a Saturday only pork emporium. I can forgive young tech execs who don't know how to craft a clean message to not offend users (though it's not really hard) Electronic Arts and P&G have been in their businesses a long time. At the end of the day this disregard for fundamental business practices is starting to show up in earnings. Abandoning a consumer focus is a sure way to kill profits. While not exactly a consumer business with "customers", I feel this way about the NRA more often lately. I hate to say it but the NRA and ACLU have lost me as well. And while I'm not up to snuff with them I have heard rumblings from friends that the ADL and Southern Poverty Law Center are careening out of control as well. I know Dave Rubin called the ADL something like a "pointless shill group". I guess all these companies and non-profits just missed the news about The Weekly Standard. They alienated their base and now they're gone. And it happened quick. I just don't get it. If I do client work my client is my only concern. I might make a suggestion like which woods work well together or how I'd recommend doing joinery. But at the end of the day the guy cutting the check calls the shots. You don't bite the hand that feeds you. I can't believe that this isn't known. Egard Watches is the first to make a counter commercial to Gillette. The tagline is "we see the good in men". They're currently backordered. This will be the marketing story of 2019. I think it is a great ad. I also thought it was offensive... it seems to assume that the majority of men in the US need to be told their preachy little tips on correct behavior. Business rumor is that brand team was chasing an Emmy to advance their careers. Recently another P&G team won an Emmy for their "brand purpose" campaign and they were corporately made. This created a perverse incentive for others to pursue an edgy campaign. Gillette's financials have been falling for years, losing 30 share points since P&G acquired them. They had to slash prices to stop the spiral. Also category is way down as more are growing beards. So those on brand were looking for exit strategy. This seemed like a good try as few companies had tried co-opting me too movement. Plus they have been getting harassed by feminist activists for the "pink tax" and thought this could neutralize that. They are getting hammered. Google trends show a 300% increase in people searching for their competitors. This dropped a huge amount of cash in their competitors pockets which they are plowing back jnto ads. it you watched the ad on youtube you are probably getting hammered by ads for Schick, Dollar Shave Club, and Harry's. It is a shark frenzy. To clarify, I think the watch ad is a great one. As I told my husband, some of my favorite people are men! I can't believe more people haven't come after Gillette for their portrayal of women. To preach that men need to hold each other to a higher standard implies that women are powerless to stand up for themselves. Normal, healthy women don't need a "white knight". I can't imagine raising my daughter to believe that she can rely on "a man standing up for her". I can get behind the idea that women are disadvantaged to men physically in an altercation but the idea that a woman lacks the capacity to determine who talks to her and how she is treated is gross. New razor is arriving today. It has been a debate in my trading mastermind group. I'm dumbfounded that otherwise smart people take the tack that all press is good. I immediately am of the belief that this is the last lunge of the dinosaur in the tar pit. Clearly there is a problem in management. How could this have been consumer tested? Or are we just running things up the flagpole and seeing what happens? If that's the case for P&G... I'm glad they're out of my portfolio. That's a monstrous red flag. I've seen groupthink hurt businesses but directly insulting your core demographic is just nuts. To add insult to injury they are deleting comments and changing the like/dislike. You don't get away with that in 2019. I don't understand the thought process. Men tend to be creatures of habit. I've used the same razor since I was 16. Over 20 years. And now I'm going to toss it. When I turned 16 they sent me the handle for free knowing I'd be a customer for life. Well the current brand team squandered that. And what if I buy every guy in the family a brand new competitor for Christmas? Every guy is like me with an ancient razor. If I show up and say "hey try this new one it works better" I might just strip a few customers. There are layers on layers of why this was stupid. P&G used to have the best ad copytesting system in the world which drove their marketing success for decades. This included use of high reputation firms like IPSOS and ARS Group which were experts in measuring behavioral brand preference shifts among category purchasers. Brand preference is what drives share and sales. But in in early 2010s on prompting of agencies many brand teams shifted into use of unvalidated "image" measures or neural response (eg brainwaves). So even when they test their ads it doesnt pick up sales impact. Nothing is as sensitive as brand preference. Unfortunately the "consumer is boss" mantra has fallen heavily at P&G. Until that is revised sales will continue to flaunder and retailers like Walmart will continue to give more shelf space to competitors creating a self-feeding process. Honestly, I think it's much ado about nothing. Sometimes a man needs the stick (Gillette's challenge) and sometimes a man needs a carrot (Egard's value). I think there are many men who need to 'man up,' but I'm not sure a commercial is the place for it. But even better is this Egard video made before the Gillette fallout. I see a man who values the influence his father had on his life. And desires to have (and help other men have) that type of influence on their child's life by valuing his (and our) time. I watched the ad and wasn't sure what it was saying but I probably won't buy Gillette stuff anyway as I get tired of this kind of thing. Great quote: "There is a special place in marketing hell for companies that invest money into things that ultimately make their situation much worse." I've read some hilarious articles about how this is the marketing disaster of the century. I actually had a former colleague, a marketing manager, email me and ponder how someone could fail marketing against sexism, something we all believe. They stole defeat from the jaws of victory. I did a back of the envelope with dad today (because engineers and accountants share the same DNA) and here's our math... I can buy 15 blades for my old Mach 3 (yeah, my razor is ancient) for about $25. So say a blade is $1.67 to me. Let's just say for agument's sake to make math easy I spend $1 on razors per week. I actually spend $1.67 because I like a fresh razor but $1 per week is easy math. Again with keeping in easy math let's say I live another 40 years. That's what Gillette has lost from me. If 1000 guys agree with me that's $2,080,000. Forbes reports the brand worth 17 billion and annual sales worth 6.6 billion. If a million guys switch it's devastating. It's possibly the biggest marketing debacle in a long time. On a related note I ordered a highly rated safety razor from Amazon and it touches up the beard perfectly. I love it. I'm gone. They're losing customers in an industry with furious brand loyalty. As in I kept my Mach 3 when they made newer models. But they are so dumb they'll let me emotionally invest in a new razor that cost money (so I might fall victim to sunk cost) and let me try the competition. They are putting the cost of new customers ahead of retaining customers (anyone with serious business experience just vomited) in an industry that relies on repeat business. Wow. 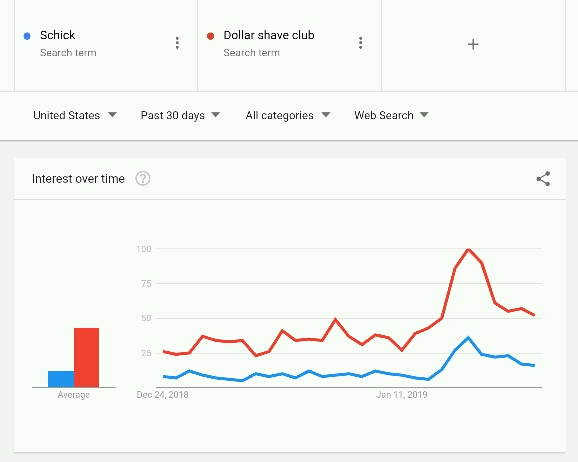 Both Schick and Dollar Shave Club search peaked at 4 times previous level and it is still at 2 times level. This is like launching a huge ad campaign at zero cost. My oldest son really likes Dollar Shave Club, and was already a customer... I typically buy whatever razors are on sale to stock the family cupboard, so no brand loyalty here for my husband and other son. However, I will probably try to avoid Gillette in the future... so they have even lost a few others as well in this mess. More details from WSJ today. P&G carefully avoided giving short term sales impact from ad. It must be pretty bad. For P&G, the gains came from household spending across a number of categories, with beauty products leading the way. Organic sales, a closely watched metric that strips out currency moves, acquisitions and divestitures, rose 4% in its fiscal second quarter, ended Dec. 31. Only its grooming business, which includes the Gillette brand, posted a decline in organic sales in the period. The Gillette shaving brand has faced competition from upstarts and has resorted to lowering prices to maintain its leading market share. Last week, Gillette released—to mixed consumer reactions—a campaign invoking the #MeToo movement. In the conference call with reporters, Mr. Moeller said some people go as long as a year without buying shaving products, making for what he described as a “long-purchase-cycle business.” He also said the Gillette brand continues to add to its users and sales. Good for you switching to a safety razor, double edge I assume. I made the switch almost 6 years ago. Bought a Merkur 33C, Van der Haven soap mug and brush w/soap, a 2 pk. of Wilkinson Sword German made DE blades all from Amazon. The blades were $0.40 ea. as I recall. All for around $50, don't remember and can't pull up the order. Since then I've spent $10 of 2 2pk. of Arko shaving soap. Only used 1 stick so far. Aprox $60 over 5 years, $12 yr. Oh yes those blades, I still have one unopened 5 pack of blades. They last very well for me even considering I'm retired and don't shave every day. On DE blades, all are not created equal. Try various brands of blades and soap to find what works and lasts the best for you. Well I'm new but I like it. I did some research and I'm learning. And it is amazing I will save money long term on blades. This is what makes me question P&G. Guys are kinda dumb. If I offered a guy the newest most ergonomic hammer in the world he'd shrug and tell me he already has a hammer. It's the male version of stupidity. When offered a new product we say "well mine works just fine and I've been using it for years". So why would a company that needs me to re-order their products continuously insult their base? I would have plodded along forever with my old razor. Why let your consumer look for a better cheaper option? And if you are an aerosol shaving cream user consider the brush and soap thing. Beside being cheaper they can be much creamier/slicker. It takes some experimentation to get that and I don't always manage it. I've recently modified my angle of attack, changed the way I hold the razor to my skin, and am getting a much smoother shave and longer between shaving days. Honestly, even though I lean waaaay left of most of the folks here on this forum, even I was cringing at this ad. Like yeah, I support reducing bullying and holding men accountable for their actions, but at the end of the day you really just want me to buy more razors. How are those two things connected, exactly? It really smacks of older executives trying to bring back the "youths" to their brand with some trendy topic they heard about on Twitter, or maybe read a couple of articles on HuffPo, without fully investing in and understanding the cause and coming off as shallow and insensitive to the actual (legitimate, IMO) issues involved. I think they could have had a home run with better agency talent. The concept was fine, the execution was horrid. Instead of "masculinity is toxic" they could have went with "masculinity means standing up for others". Instead of stereotyping all men as mysoginist sexual assaulters, they could of highlighted men who have gone the extra mile to protect others. Instead of showcasing a holocaust denier, they could have showcased the stories of men like Nicholas Winton (https://www.youtube.com/watch?v=POCCJ-8zds8) and Johan van Hulst (https://www.telegraph.co.uk/obituaries/2018/04/11/johan-van-hulst-rescued-jewish-children-amsterdam-obituary/) The idea is that they are honored to provide the "best razors a man can get" because men like these provide the best in life to others. They could have inspired instead of insulted. If you don't mind me asking did the portrayal of women seem offensive? That really ground my gears. I really don't like that they portrayed women as damsels in distress waiting for a man to save them. That was bothersome. Of course if some guy was assaulting a woman I'd knock the snot out of him but I grew up with a mother who has an MBA and married a woman I met in engineering school. I can assure both are capable of a a royal "f*ck off". Real men love strong women. I strive to be Justinian to my wife's Theodora. If you don't mind me asking did the portrayal of women seem offensive? That really ground my gears. I really don't like that they portrayed women as damsels in distress waiting for a man to save them. That was bothersome. Honestly I don't remember, I could only be bothered to watch it once lol. I definitely don't like it when women are portrayed like that, but I think what they were (trying to) get at was more subtle: Women shouldn't need saving because men shouldn't act in a way that requires them to be saved (i.e. not catcalling random women and making them feel unsafe). The whole idea of "toxic masculinity" is basically the reverse of tomboyism, that is if it's socially acceptable for girls to act like boys, then it should also be socially acceptable for boys to act like girls (i.e. emotional and vulnerable. I'm really paraphrasing here). Being a "man" doesn't have to mean being a "hero," or having to "protect" people. 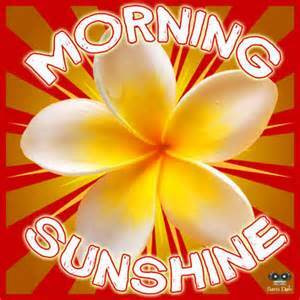 It also means listening to and cooperating with other people, and being aware of other people's emotional states. At least that's the gist of what I see my super liberal feminist friends talking about (I went to a liberal arts college, I have a lot of those). In principle I don't disagree with them, but in practice it's really hard not to come off preachy as hell, because it always ends up sounding like "hey men, you should just be decent human beings," and then the (predictable) response is "#NOTALLMEN YOU LIBTARDS".